I initially contacted Ginny Jacks one December to ask if she would provide an estimate for lighting my house for the holidays. She was very pleasant on the phone and came out the following day. She and her husband had a brochure to show me what the finished product might look like. They also had samples of the garland in the car ready to show me. When I could not decide if I wanted a 3' or a 4' wreath hung from my balcony, Harvey carried one up to the balcony for me. Then Ginny and I could better decide the best size for my balcony. Because it was already mid December when I placed my order with them, a few items were out of stock. They installed what they had (most of the items I had requested), and the remaining garland came within a few days. Ginny and Harvey came out the next day to complete the installation. At the end of the holiday season, Ginny contacted me to find out when would be the best time to take down the lights. She worked around my schedule and came before I had a party scheduled. In a few hours, the crew had taken down the decorations and stored them away. One of the reasons I chose them was that my son had a special lighting request. He wanted a 9' and 2 6' lighted tress put in the yard. We had the bases for the trees, but stringing the lights on them is a bit time consuming. Ginny and Harvey said they would give them a try. (Another company did not want to install them because the bases were not their equipment.) She even picked up the box with the instructions and base prior to installation so that her technician could study it. While they were installing the trees, Ginny took notes so that the installation would go even faster the following year. I have enjoyed working with Amazing Holiday Lights. I recommend them highly! We had Amazing Holiday Lights do our Christmas lights last year and they did an outstanding job. This is a service where you purchase the lights/wreaths/garlands from them (whatever you want for your home) and they install, remove and store them for you. The products were much higher quality than I could find at Home Depot or similar stores. The price for everything was reasonable, especially considering all the time they saved me. They're doing our lights again this year. After the first year, you just have to pay for the install, removal and storage. All in all, I highly recommend this company! They're lovely people and your home will look terrific! Hi--Happy new year!!!! Loved my lights!! THANK YOU FOR MY BEAUTIFUL LIGHTS! You did a great job! Very satisfied with your service, excellent product quality. And I have gotten one electric bill while they were up, and the lights didn't significantly increase the bill! One last thing...the placement of the starburst in the live oak to the right of the entrance was excellent. I could see it as I drove over the crest of the hill just shining out there. So please place the starbursts the same way next year. Thanks. We have been quite pleased with our "Amazing Holiday Lights", and have already recommended you to others. Thank you for an amazing job! Can�t wait until next year!!! We were very pleased with the way the lights worked out. We received emails and phone calls from several of our neighbors, letting us know how much they enjoyed our lights as well. We were very satisfied with the professional service that you provided. The lights looked fantastic, and our neighbors went out of their way to say how much they also enjoyed our lights. We had only one problem � half the lights on one starburst did not work. This problem was taken care of immediately, and to our satisfaction. I would definitely recommend Amazing Holiday Lights to my friends and neighbors. We also wish you could provide the same service for our house in Houston. We had a terrible experience with a holiday light company in Houston a couple of years ago, so we were a bit wary of working with Amazing Holiday Lights in Spicewood. Thankfully, your company showed us that the service could be done professionally, with fantastic end results. As always, we were so pleased with your service, and you can quote me anytime! 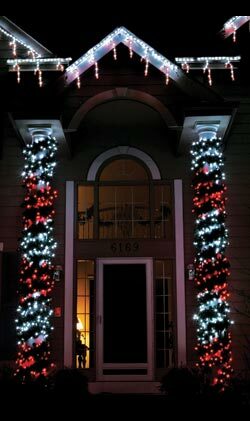 Click here to email us your own Amazing Holiday Lights testimonial.